While we’re on the subject of pubs and guiness, lets not forger the harp. Perhaps the best known emblem representing Ireland. Live music is still a regular event and not only the Irish traditional type to lure passing tourists. In the midland rural counties American country music has risen in popularity. This influence in turn has spawned country and Irish, mixing American country with Irish influences and traditional folk music. Like horses and horse racing, music is part of the genetic makeup of the Irish. My other half, never far from his Fender, upholds the tradition that the country’s youth are brought up on the back of a pony only a riff away from a guitar, a fiddle or a singing relative. 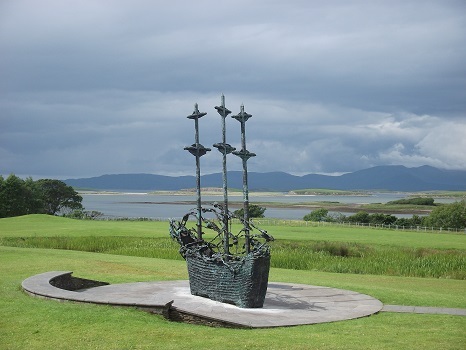 Traditional Irish music and all its derivations remains a strong influence on mainstream popular music. 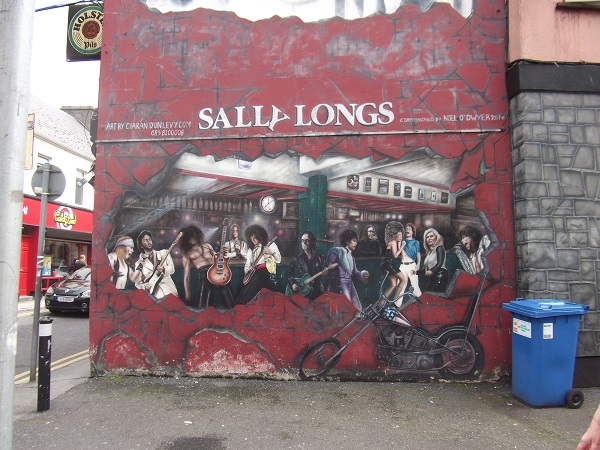 On our previous visit I was whisked off the Galway to drink in Sally Longs. With its murals and toilets labelled confusingly Sally’s and Long’s, it is perhaps one of the most famous pub live venues for metal and rock. However, one of my lasting memories of Ireland is huddling under a brolly in the pouring rain at a music festival in Spiddal on the Galway coast listening to the strains of Gaelic folk music and watching Irish dancers. For me, it was the musical equivalent to the incense aroma of a peat fire. 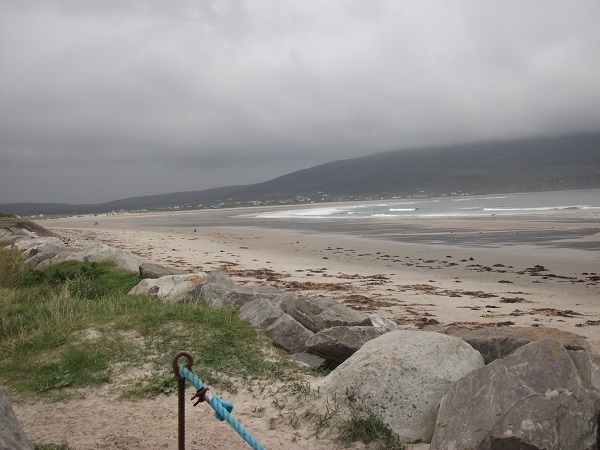 One of our latter tourist jaunts was to visit Achill Island on the West Coast. The island, jutting out into the Atlantic Ocean, is joined to the mainland by a strip of land, so avoiding the delay of a ferry. Scooting down the winding roads, we passed the smattering of homes with donkey effigies tethered to peat carts in well tended front gardens. Our passage watched by any number of curious donkeys that were alive and kicking. This gave way to acres of peat bogs and dramatic rising hills and a fish farm in a stretch of mirror still water beneath a steeply rising cloud topped mount. Introduced industry has never really taken off in Achill and like the rest of Ireland, it owes a lot to its preserved troubled past. It is pretty much untouched by the destructive hand of humanity and has a wild and dramatic natural beauty. Sweeping up an incline we found ourselves looking down on Keel village, its stunning beach set against a backdrop of neck-breakingly high sea cliffs. With its whitewashed cottages strewn around the far side of a broad Atlantic inlet and clustered below us, it was eerily quiet. The only inhabitants to be seen were the obligatory sheep grazing on the road side, and as we rolled down into the village, munching on front lawns. “It reminds me of the set of a Stephen King book,” I mused, imagining hidden faces peering at us from behind the safety of dark windows and only emerging as a clawing mist descends at dusk. “Hmm, can you shut up now?” The other half, not a great fan of Mr King was not amused. 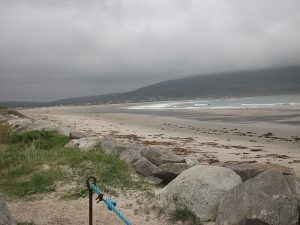 However, sitting in the local pub, nursing our club oranges and musing over the backward clock behind the bar (and yes, it really did run backwards), Achill proved to be as warm and welcoming as the rest of Ireland. The Emerald Isle has an uncanny habit of getting under your skin and creating lasting memories, not only because this trip happened to be our honeymoon. Every trip spawns a long list of must see’s and widens the experience of Irish eccentricity. This time round it was the old guy leaning against the open driver’s window chatting to his smiling mate, the driver. We looked on, hearts pounding after the slowly unfolding fatal car accident had suddenly turned itself in to a pleasant parle in the middle of a pedestrian crossing with traffic queuing up behind. On reflection, it would seem to be the same Irish logic that flagged us down, jumped into the back of the car, began an interesting conversation about Irish nationality and asked to be taken to the pub.